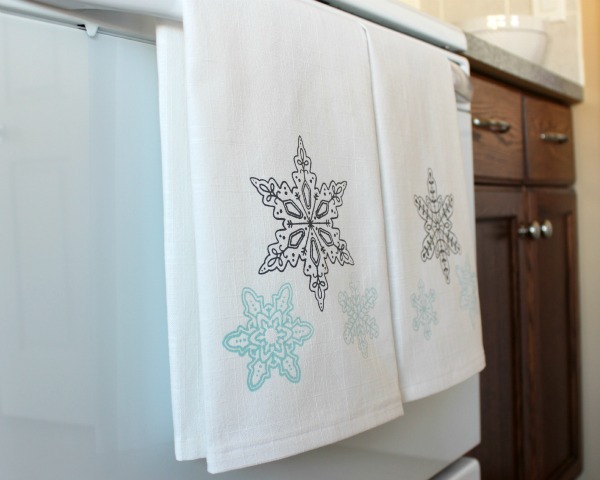 Learn how to make snowflake printed tea towels using fabric paint and silkscreens. A fun and easy craft idea you can keep or give away! As some of you may remember, way back in May and June, I was part of the Outdoor Extravaganza. I had so much fun collaborating with a few of my blogger friends during the series that I decided to create something similar this fall, but with a new twist. For the One Item Project Challenge, each blogger was given a specific craft supply to work with per week and had to create or decorate something with it. To kick off this 3-week series, we started with fabric paint. I have been wanting to try Martha Stewart’s fabric paint medium for a while now. It can be mixed with an array of colours of acrylic paint to make it soft and adhere to fabric, even through a delicate wash cycle. Although I’ve done a lot of fabric painting projects in my textile design classes at university, I never got to try my hand at screen printing. 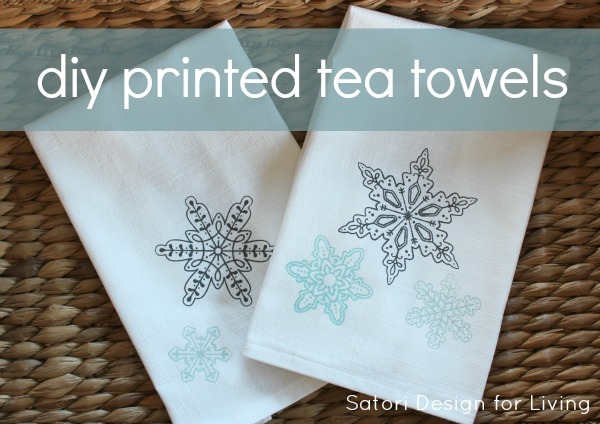 Martha Stewart makes a good selection of pre-made silkscreens, and I thought it would be fun to try them out and make some printed tea towels. Some affiliate links are included for items I used for this project. Check out my blog policies here. Instead of purchasing tea towels, I decided to make my own since I had a cotton/linen remnant left over from a drapery project. Whether you’re using pre-made towels or creating your own, be sure to pre-wash the fabric and iron smooth before you start the printing process. 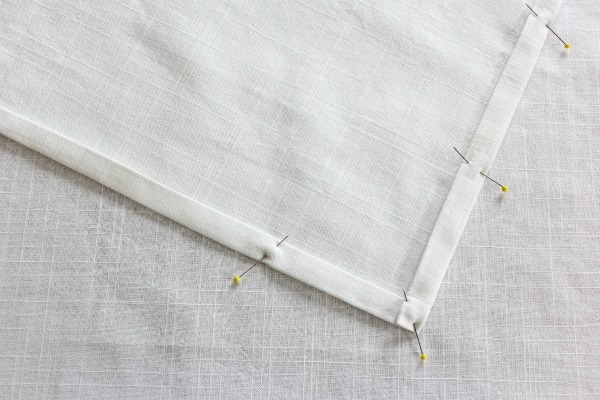 To construct the tea towel, I cut two sizes measuring 20″ x 28″. Next, I pressed the raw edge ¼” in around all sides and turned it again exposing a 5/8” hem that I pinned and stitched in place. 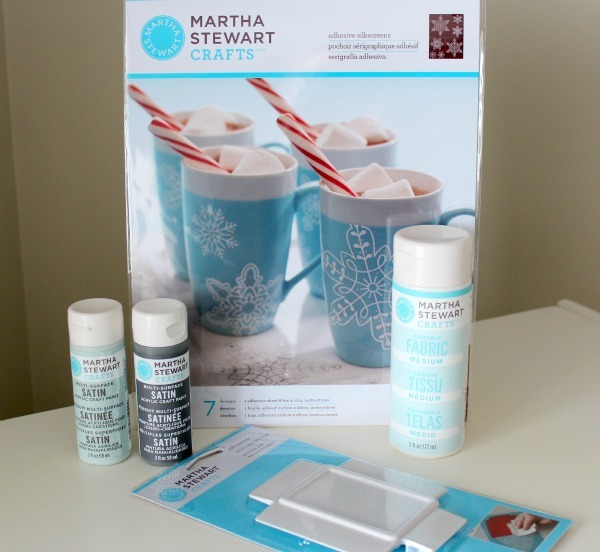 For the design, I selected a collection of Martha Stewart snowflake silkscreens, as well as a light blue-green paint (cloud) and a dark grey color (arrowhead). 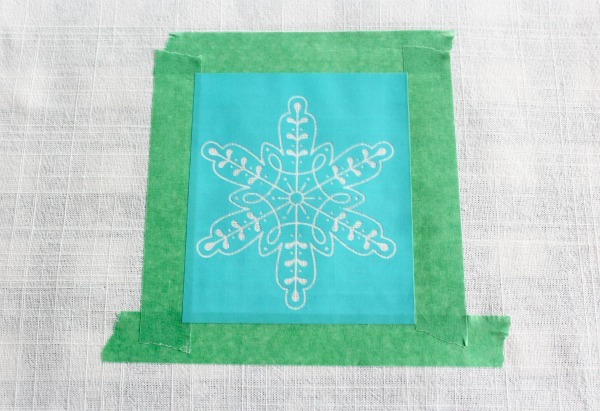 To begin with, I centered a large snowflake on the bottom of one tea towel about 4″ up. I affixed the adhesive screen and taped off the perimeter with painter’s tape to be safe. Make sure you put the tape slightly under the silkscreen and not over because the screen is delicate and may tear when you take the tape off (I learned this the hard way). Next, I mixed one part fabric medium to two parts paint and applied a generous amount on one side of the silkscreen. Using the squeegee, I pulled the paint across the silkscreen, making sure to cover the open pattern. I used the squeegee to take off any excess. 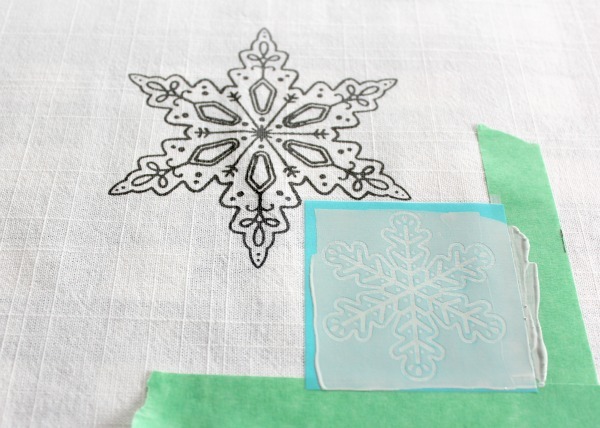 After pulling off the screen, I was left with a large grey snowflake and repeated the procedure with a smaller silkscreen and the cloud paint. Make sure you rinse the paint off each silkscreen immediately after using so the paint doesn’t set. After applying two snowflakes to each tea towel, I decided to add one more in a robin’s egg colour I had in my craft stash. After allowing the paint to dry for 24 hours, I covered the snowflakes with a cotton cloth and set the colour with my iron on the wool setting for about 30 seconds on each section. To protect the snowflakes, I plan on washing the towels on the delicate setting as needed. For me, they’ll be more decorative than utilitarian, so they should last. This project was super easy and a lot of fun! I’m planning on using the fabric paint to create a pin board for my office and perhaps a decorative pillow or two. Be sure to come back next Wednesday to find out what the second craft supply was on our One Item Project Challenge list and see what we all did with it. 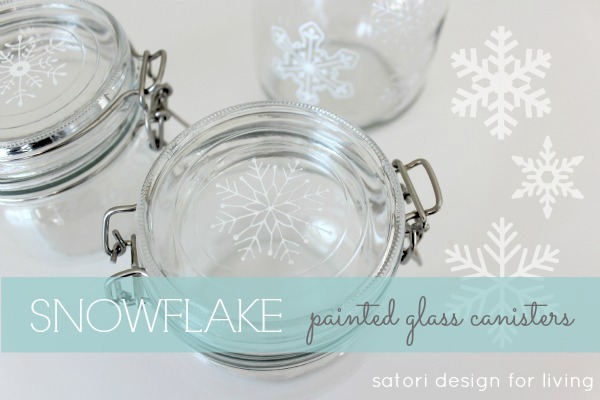 For another project idea using the snowflake silk screens, check out my Painted Glass Canisters. Thanks Cassie! These silkscreens are really easy to work with and I’m sure with mom’s help your kids would make out fine. Your project sounds fun and I know their grandparents will love them! Ooohh.. These are so pretty Shauna! Hmm. I think a trip to Michael’s is in order now that my power is back on! I love the simplicity and the color selection! They will last you through the holidays and during winter! Thanks for hosting! Can’t wait for next week! I want these. They go perfectly with my holiday color scheme. I love the snowflake stencil leave it to Martha to make the perfect snowflake. You did an amazing job! Shauna, these tea towels are gorgeous! As if not busy enough…now you need at etsy shop! These are fabulous!!! 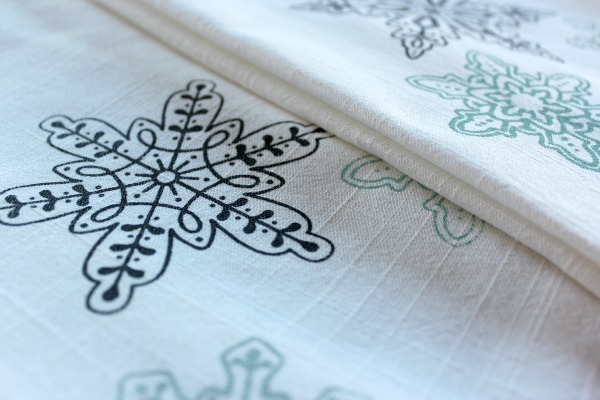 I have tea towels on my ‘to do’ list…you’ve made me want to get going on them! I don’t remember Artex, but I did a lot of wax resist with dye and even some fabric block painting using wood blocks I created from drawings. It was a lot of work, but the results were beautiful. These are so beautiful! I’ve been wondering for a while…what is the difference between silk screening and stenciling?? The process seems similar, but I’ve never used a squeegee, so obviously there is something different! :) It looks like lots of fun. I’d love to give it a try. The screens have tiny holes that allow the paint through in only certain areas. They seem to be a little more precise than stenciling. Really fun to do- you should give it a whirl! I found your blog through Pam @ Simple Details and I just spent the last 30 minutes going through some of your old blogs. Awesome ! I am so happy to have found you. You seem so organized and creative and fun! I’ll be back often! I love this Shauna!! You did a great job and provided an easy tutorial, I am going to have to give this a try. Perfect for that homemade Christmas Gift! Enjoy your day! What a great project! Perfect for the holidays. I haven’t ever screen printed but this makes me think even I can do it. You can totally do this- very easy and rewarding! Love these Shauna! They are almost too pretty to use! Definitely want to try this fun DIY…they would make perfect handmade gifts too! I don’t think I’ll be using them for pots and pans. I’ll likely pull them out when I’m entertaining since a lot of my other towels I use regularly aren’t that pretty. Thanks for stopping by! These look great! They are so simple, yet so cute. I cannot wait to try this. Thanks for the inspiration. These are so pretty, love the colors you chose for the snow flakes. I’ve never done silk screen, but may have to give it a try. Thanks for sharing the tutorial with us. Your tea towels are soooo pretty Shauna! I’m so glad to see a winter project shared with Throwback Thursday. I know that a lot of people are thinking about crafts they’d like to make in January and your tea towels are perfect. your cuptowels look GREAT! A must do… maybe for a gift! These are so delicate and pretty ~ I love how crisp the snowflakes turned out.